MGM announced that “MGM Lion Dance Championship – Macau International Invitational 2018” will take place at MGM Theater at COTAI on November 10 and 11. [August 22, 2018, Macau] MGM hosted a press conference for the “MGM Lion Dance Championship – Macau International Invitational 2018” and a graduation ceremony for the “Junior Lion Dance Training Program 2018” today at MGM COTAI’s Ballroom. MGM announced that this year’s Championship will take place at MGM Theater at COTAI on November 10 and 11, introducing Macau’s first Junior Lion Dance Performance Competition. 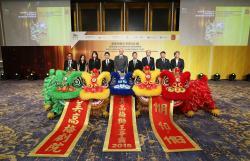 The “MGM Lion Dance Championship – Macau International Invitational 2018” is co-hosted by Wushu General Association of Macau, and supported by Macao Government Tourism Office (MGTO), Education and Youth Affairs Bureau (DSEJ) and Dragon & Lion Dances Federation of Asia; while the Junior Lion Dance Training Program is a collaboration with Hong Wai Dragon & Lion Dance Association Macau and also supported by MGTO and DSEJ. Guests of Honor in attendance at the event were Mr. Zuo Xianghua, Director of Economic Affairs Department of Liaison Office of the Central People’s Government in the Macao SAR; Mr. Anthony Leong, Acting Director of Gaming Inspection and Coordination Bureau; Ms. Jennifer Si Tou, Head of Tourism Product and Events Department of MGTO; Mr. Wong Chi Iong, Acting Chief of Department of Education of DSEJ; Ms. Fong Fei, Head of Sports Associations Support Division of Sports Bureau; Mr. Cheang Kuok Heng, Deputy Director of Wushu General Association of Macau; Mr. Chow Chi Man, Chairman of Hong Wai Dragon & Lion Dance Association Macau; Mr. Hetzer Siu, CEO and National Director of Macau Special Olympics; and Mr. Grant Bowie, Chief Executive Officer and Executive Director of MGM China Holdings Limited. The event kicked off with a dynamic performance by Macau Special Olympics’ lion dance team that is sponsored and supported by MGM. The lion dancers wowed the audience of nearly 200 with their stunning moves and showmanship. At the invitation of the Wushu General Association of Macau, the “MGM Lion Dance Championship – Macau International Invitational 2018” features lion dance teams from 14 countries and regions including China, Malaysia, Singapore, Chinese Taipei, Indonesia, Vietnam, Thailand, the Philippines, Hong Kong SAR, and Macau SAR. In addition, the Championship gathers the very best lion dance teams from Australia, the United States, Cambodia and Myanmar, making the competition truly international. The two-day action-packed Championship will also include the “Female Traditional Lion Dance Championship” with international standard rating system, and Macau’s first “Junior Lion Dance Performance Competition”. A certificate presentation session was then hosted to congratulate the fresh graduates of the fourth class of the Junior Lion Dance Training Program, which took place over the past seven weeks. A total of 70 graduates aged between five and eight were awarded with certificates, and the joyous occasion concluded with an exhilarating lion dance performed by these new little masters, all decked in costumes and armed with full sets of props.